Ombre Owl Artwork, using Halloween silhouettes from the Dollar Store. This was really quite easy to do. Now lets paint our ombre effect. 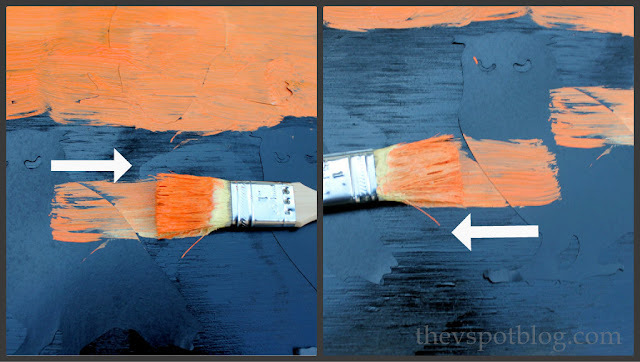 I always start with the lightest color and work my way up to the darkest, using the same brush and just blending as I go. One thing to keep in mind. These owls are paper. When paper gets wet it starts to warp, so you’ll want to move fairly quickly. Try not to have the brush strokes go on to the owls as much as come off of the owls. 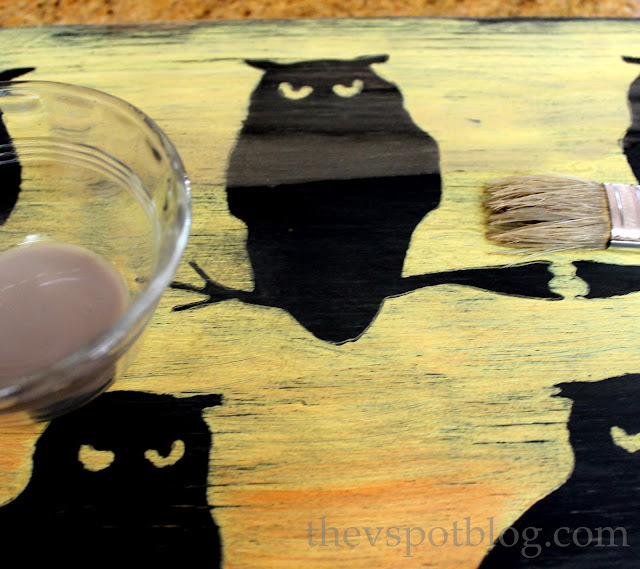 If you had the paint pulling towards the owl you risk the paint bleeding under it. 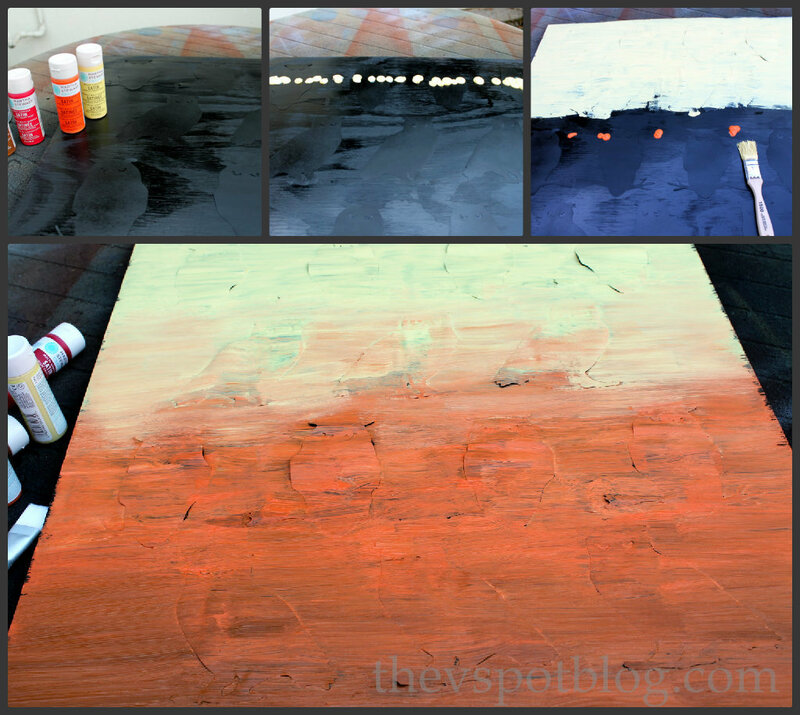 It’s not a perfect seal and you want to take care when applying the paint to minimize that risk. 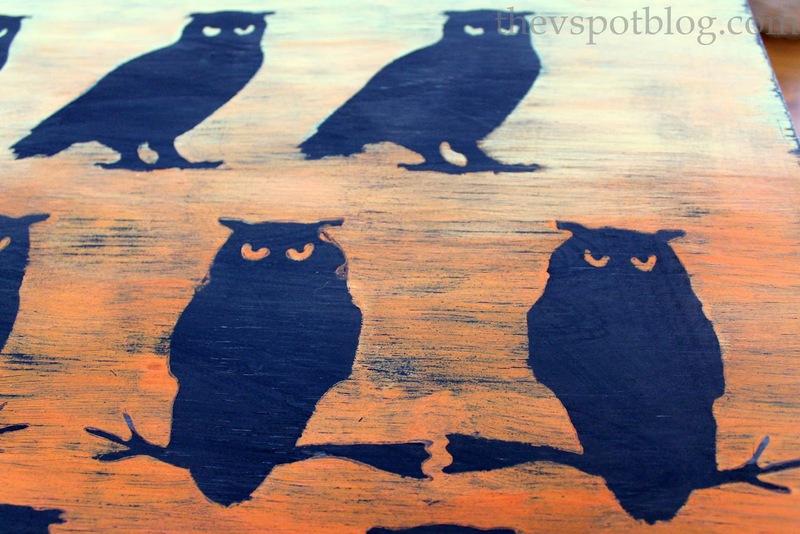 You’ll notice that the paper owls will start to warp once the paint soaks in to them. That makes it easier to peel the paper back off. (Since the stencil adhesive is designed to be repositionable, that helps too.) Peel off all of the owls and let it dry thoroughly. Next? Sand the crap out of it. You want the black paint to show through in places. Sand, sand, sand. Then sand some more. If you don’t have a hand sander, you can pick up a cheap one for about $10. Every craft supply closet should have one. Wipe it down with a slightly damp cloth to get all of the dust off of it, then water down some gold paint to make a wash. Applying this watered down gold paint in a light coat creates a bit of a sheen, but it also adds to the distressed “old” look by muting the colors a bit. I’m very happy with how this turned out. $1 for the owls, $3 for the board and I had everything else on hand. Yay me for keeping it under $5! LOVE this! It looks like an setting of the sun on a spooky evening. So cool! What a great, inexpensive piece of artwork! LOVE THIS! Thanks for the great how-to. So creative and I love projects like this. Thanks! Such a fun project! 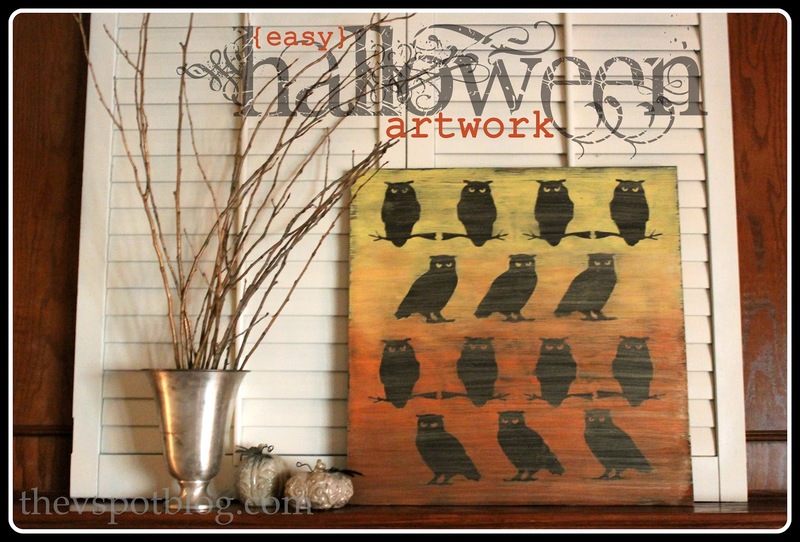 I’ve pinned it into my Halloween folder and am going to try to find the owl stencils. Thanks for sharing! I just saw this on Pinterest! I wanna try the spiders! What a hoot! I love owls to obsession. Great idea. Well I’d like to say something different than everyone else, but love it just about covers it. I love it! Pinned it. Cauuuute! You nailed it! Looks like way more than $4. art! 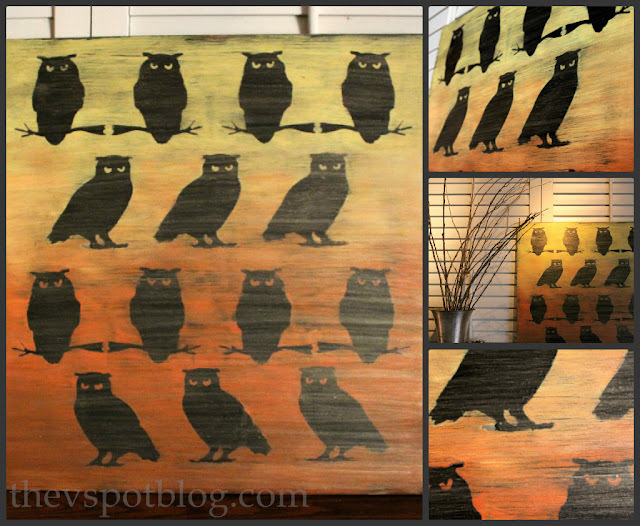 I have those owl silhouettes – they are the best! This is the best project ever! Pinning it! $3 for the wood? I just bought a piece for the sign I made for the guest bedroom and paid $33. Now, I did buy a nice piece of pre-sanded pine but $3? Clearly I’m shopping at the wrong store! I love this and may have to add it to my Halloween collection! How cool! Just saw those owls at the Dollar Store today. I am in love with your owl art! So graphic and just perfect for the season. Pinning!